An online Prevent training course for all staff with a requirement to fulfil the government’s anti-terrorism strategy, the Prevent duty. This Prevent course delivers an overview of Prevent, helping you to identify extremism and its associated risks, and know how and when to report concerns. Very detailed information. Easy to understand but gives you all the information you need to know. I enjoyed doing the course and learnt a lot. I am based in England/Scotland/Wales/Northern Ireland. Is this Prevent course suitable for me? Our Awareness of Prevent Duty online training course provides an overview of the Prevent duty in relation to staff working in a number of different environments. This information is relevant in England, Wales and Scotland, however, if you are based in Northern Ireland the Prevent legislation is not applicable. I do not work in a school setting. Is this Prevent course suitable for me? Yes, our Awareness of Prevent Duty online training course provides an overview of the Prevent duty in relation to staff working in a number of different environments. The information delivered in this course is suitable for staff working in all sectors, including those working in education. Prevent, a strand of the Government’s counter-terrorism strategy, intersects with the safeguarding of young people and children. This course is designed to raise your understanding and help you to relate Prevent to your own interaction with children. 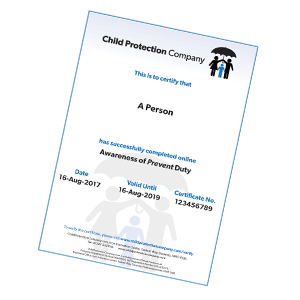 It is suitable for anyone who may have contact with children, young people and their families as part of their daily activities. This module uses four scenarios to help you assess your current level of knowledge and begin thinking about the issues and surrounding radicalisation. At its heart, Prevent is another form of safeguarding and exists to stop people supporting terrorism. Groups who pose a threat to the UK seek to recruit people through a process of radicalisation. Whether right-wing Nazi sympathisers or ISIS, we do not need to understand the ideologies being promoted, but we do need to be aware of the process of radicalising young people. By the end of this module, you will have an overview of the aims of Prevent. The Education Act (2002) sets out the responsibilities of Local Education Authorities (LEAs) in relation to ensuring that children are free from harm. Safeguarding against radicalisation is part of this responsibility. People who come into regular contact with vulnerable children and young people have a role to play in the prevention of radicalisation as part of the wider, inter-agency initiatives to safeguard children. Ofsted inspectors will expect to see an approach to keeping children safe from radicalisation and extremism. At the end of this module, you will have a better understanding of the multi-agency approach to safeguarding against extremism. You will also have an overview of the legal guidance and framework, and the requirements for safeguarding in an education environment. Vulnerability to radicalisation can be the result of many different motivators and can manifest in many ways. Although terrorism is unlikely to be the cause of changes in behaviour, we need to be aware of the possibility and be able to offer support. By the end of this module, you will be more able to recognise indicators of potential vulnerability to radicalisation in a young person. A number of factors can be involved when someone is at risk of terrorist activity or radicalisation. As well as an increased use of key phrases associated with the rhetoric of hate speech, the young person may display several other indicators, such as wearing a particular ‘uniform’, or avoiding certain groups of their peers. By the end of this module, you will be more familiar with the behaviours and actions that could point to a child at risk. Radicalisation is a process, and Prevent can be a way of intervening when a child or young person is taking the path towards extremism. The move towards support of a radical ideology will involve developing a rhetoric of hate towards a particular group of people. This module looks at the methods employed by Prevent and, where appropriate, CHANNEL to refocus the young person to a less radical viewpoint. Using a range of scenarios, you will now take all that you have learned and apply it to an assessment of your knowledge. The final assessment is your opportunity to show how much you have absorbed and why it is so important to have Prevent Duty awareness training.